"Shop Diller's for style, value and superior customer service." Your home. Your Style. Shop Diller's. Diller Fine Furniture is a family business that began in 1903 specializing in only quality furniture, home decor and bedding. 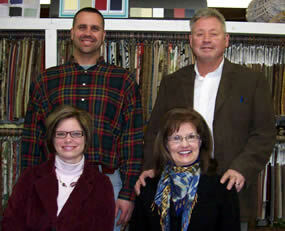 Diller's is a low pressure place to shop with people and furniture you can trust. 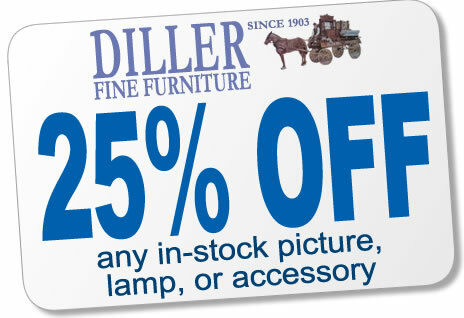 An easy drive from anywhere in Northwest Ohio, you will find Diller's Fine Furniture just north of Lima, Ohio on St. Rt. 65. Our rural location allow us to keep our overhead low which translates into big savings for you. We are proud to carry quality, stylish furniture, comfortable mattresses, as well as hundreds of pictures, lamps, and home decor items from the Nation's best brands with the great customer service you can only get from a family owned store. We invite you to shop Diller's before you buy anywhere else! Mon & Wed: 10am-7pm, Tue, Thu, Fri, & Sat: 10am-5pm, Sundays by Appointment. Palettes by Winesburg is committed to handcrafting the highest quality products on earth and leaving it a better place. Use their Creation Tool to design your own custom dining room in a variety of beautiful styles and finishes. We invited you to join our Super Savers Club and be eligible for special sales, discounts, and events only for club members. Join today and we will send you a gift card worth 25% off an in-stock picture, lamp, or accessory purchase. Sign up today! Why buy your new mattress from Diller's? Providing you with your best night's sleep is the goal of everyone here at Diller Fine Furniture. We accomplish this by matching the way you sleep with the perfect mattress. Firm, soft, innerspring, hybrid, cool gel memory foam... with or without an adjustable base, be confident when you shop the Mattress Shop at Diller's you will get a quality mattress from the Nation's best brands, Tempur-Pedic and Simmons BeautyRest at the very best price. Shop the Mattress Shop at Diller's for your very best night's sleep. We invite you to shop our store for a low pressure shopping environment and the best selection of Tempur-Pedic and Simmons BeautyRest Mattresses at the area's best prices. Let us help you get your "Best Night's Sleep"
Diller Furniture is a family business that began in 1903, specializing in better quality furniture. The Diller family invites you to shop their store and see beautiful displays as well as hundreds of pictures, lamps, and home decor. Diller Furniture is a low pressure place to shop, with people and furniture you can trust.